Spotting a cockroach in your home or office is alarming. When there’s one, there are usually more not too far behind. Although these stubborn critters may be difficult to contain, a qualified exterminator will make quick work of them. However, having a thorough understanding of these unwelcome bugs will mean you can effectively prevent an infestation later on. Finding a cockroach inside isn’t a sign that your property is dirty. These pests typically arrive in search of warmth and food. This is why they’re typically found in dark, humid areas of the home, such as bathrooms, kitchens, and laundry rooms. They’ll often take shelter in spaces you might not consider, such as beneath sinks, behind appliances, and in pipes. Some types prefer cooler, wet areas, like basements. A cockroach sighting alone may alert you to contact an exterminator, but there are other signs to keep in mind. The most obvious are visible droppings, which resemble ground coffee and may produce a bad odor. Cockroaches also shed their skin as they mature. Keep in mind that while they’re small, the insects are quite tenacious. They can easily damage your belongings in search of food. Look for disturbances on food packages, cardboard boxes, and even books. How Do You Control the Situation? 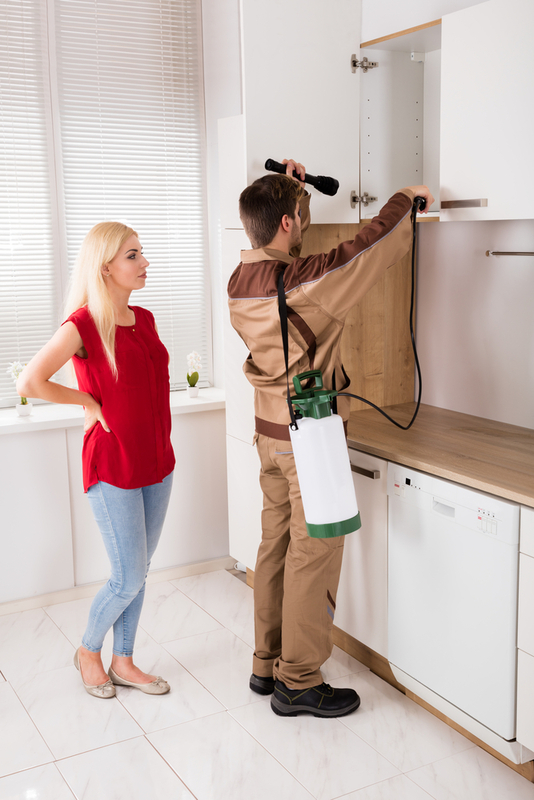 Although over-the-counter products exist, it’s typically far more cost-effective and productive to hire an exterminator. They will determine the best line of defense based on the type of cockroach and where on your property it’s located. They will also offer you detailed pest control tips so that you can avoid similar situations in the future. Since shelter and food are appealing to cockroaches, your best option is to minimize their access. Make sure there are no traces of food or water anywhere in the kitchen and bathroom by cleaning floors and surfaces carefully every day. Tie up and throw out trash bags right away so that the bugs don’t sniff their way inside. Eliminate any clutter that could serve as a convenient hiding place, like piles of firewood outside, rolled up newspaper bundles, and cardboard boxes. Finally, seal all visible entry points around doors and windows. These eager bugs don’t require much space to come inside. While the presence of cockroaches and other insects is certainly disturbing, you don’t have to deal with them on your own. Turn to the exterminators at Danny’s Termite & Pest Control in Lancaster, KY. Serving Central and Eastern KY, these qualified pest control experts offer more than 50 years of industry experience, and they have a thorough understanding of different types of bugs and how to best handle infestations. Visit their website to learn more about their roach control services, or give them a call at (859) 792-1245 to arrange a free estimate.